As I drove home around 6:00 from a late appointment in the office, I began to hear SVR then TOR warnings on the radio for storms to the north and northwest of STL. I had been very busy all day so had not looked at weather since a brief glance in the morning. We had been under a slight risk from SPC but nothing that looked too exciting. But the way these warnings were popping, I couldn't wait to get home and look at the radar. When I came in I was lucky enough to catch radar on a local newscast and saw a cluster of 3 or 4 strong storms to the north of the metro area - and with all these TOR warnings popping some of them had to have supercell characteristics. Indeed they did, for reasons that are well-explained in the next Day One Connective Outlook from SPC that came out about an hour later. Anyway, with all these storms popping so close, I decided it was worth a chase, though I figured the rotation could be short-lived and that the storms might quickly merge into a squall line. My daughter wanted to go with me; usually I don't let her but I really didn't think the dynamics were strong enough to get us into anything too ticklish so I agreed. We grabbed the chase gear and jumped in the car. 6:25 - Out the door. We decided to head north toward Macoupin County, which would give us the option of intercepting the leading storm or working our way west to others, as the storms were lined up east and west. Minutes after leaving we hear another tornado warning for Missouri, but more important, the radio repeats this tornado warning , for southern Greene and northern Jersey Counties in Illinois. A check of the map shows that, with the meso reported over Kane and moving east at 25, this movement would take it along the Jersey/Greene County line and into Macoupin County a little north of route 16. Perfect, since we could pick up route 16 where route 159, our route north from Edwardsville, ends. I figure we can intercept the storm within about 30 minutes. 6:45 - We cross into Macoupin Co., headed north on 159. We can see dark sky and lighting, including some CG, ahead, but no storm structure is visible through the haze. The sky is overcast with a mix of anvil and mid-level stratiform clouds. This severe weather statement indicates what was going on around this time - the meso continuing to progress toward our intercept point. Also around this time we hear a tornado watch, which encourages me to think that rotating storms may be more persistent than I had earlier thought. 6:50 - Tornado warning is issued for central Macoupin Co., based on radar meso near Medora at 6:48. Perfect, we think! This should carry the meso parallel to route 16, about 3 miles to its north. Now we can see lots of CG and dark clouds ahead but still there is not much storm structure visible, though an updraft tower can be seen to the NW in poor contrast through the murky haze and with anvil over and behind it. 6:55 - Into light rain. We will have at least light rain the rest of the time for the entire chase. Wind is SE, inflow to storm, as will also be the case through the entire chase. Now and at most later times, the inflow is weak, though. We round the corner where 159 ends and head west on 16 - lots of darkness and CG ahead (to the west) and on the right (to the north). 7:00 - We view what appears to be a rain-wrapped meso just east of Shipman, to our NW. Striations are evident above the scuddy updraft base. There is a very dark area under one part of it, but rain hides it so we can't see what it is. I realize we are going right into intense wrapping precipitation if we go any farther west and see a small parking lot near a utility property on the right of the road, slightly elevated. After blowing by, I turn around and return to it. Here I videotape the base and striations - again it has the look of a rain-wrapped meso but I can't see what is inside, in part because although the spot is high, trees are blocking the view in the direction of the center of the meso. Partly for this reason and partly because it is bearing down on us, I leave and move slightly east. After moving and getting clear of trees, we see large bulbous, partly rain-wrapped lowering. [ NOTE: Due to the poor contrast and wrapping rain, the contrast on this video capture has been enhanced. That is the only way in which it has been altered.] Although we had not heard the tornado report at the time, this - and the dark area we had seen minutes earlier - was almost certainly the remains of a tornado that was reported by police at 6:50 south of Medora, about 5 miles west of our location. The tornado touched down briefly in open country and dissipated, doing no damage. Again we were approached by intense precipitation wrapping around the south side of the meso - perhaps from a wet RFD, or from the next storm down the line, or a combination of the two. The whole thing was very HP-ish, with poor contrast and lots of wrapping rain. In order to avoid getting swamped by this oncoming precip, we moved back east to the intersection of 16 and 159. Somewhere en route I looked at my watch and saw that it was 7:05. 7:10 - We briefly stop at the intersection of 16 and 159 to watch the storm. A couple spotters are there in a pickup with an orange flasher, but it was quickly evident that we and they were going to see nothing from that position - the rain had moved between us and the meso and totally obscured any view of it. Heading north for a better view seemed very risky, and other tornado warned storms were to the west, so we decided to head back south toward Bunker Hill and try to get a view of the next storm west, if we could get around the oncoming precip. 7:25 - We view a second suspicious area to the W and NW, from 3-4 mi west of Bunker Hill. Scuddy lowerings, with some slight rotation, are under the SW end of the low, ragged updraft base, which is so dark and low it that there is nothing but darkness as it extends off to the northeast. Still more storms and lightning are evident to the west and southwest of this storm. Inflow here is a little stronger. 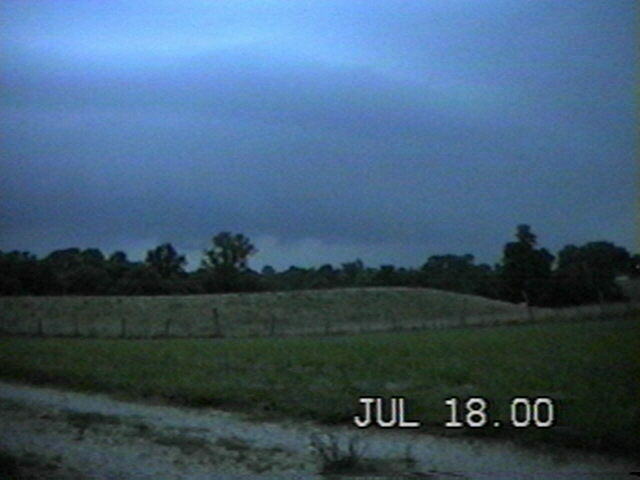 This picture shows the low base of storm; the area where I observed slight rotation was to left of this. As the storms backbuilt, this storm was apparently becoming the dominant one, as the original meso, now to the north or northeast, apparently occluded and weakened. This tendency can be seen in this Severe Weather Statement. 7:35 We have now headed to the south side of Bunker Hill. Getting home safely becomes a concern, because more storms are to the west, and one has a new tornado warning which includes western Madison Co., just to our southwest. This TOR is based on meso near Grafton, (which was later reported near Elsah in this Severe Weather Statement). The storm we had been watching was passing just north of Bunker Hill now, and the sky was incredibly dark. I tried to find a spot to see it, but the town blocked too much of the view. I was not about to go north of town because 1) I could be cut off with no escape except into the town and 2) too much delay would allow the Grafton storm to cross in front of me and block a safe return home. So, after a few minutes, we headed south from Bunker Hill on 159. Newspaper reports indicate that Bunker Hill firefighters sighted funnel clouds, but it is another fifteen minutes or so before a tornado warning is issued on this storm as it approaches Gillespie, northeast of Bunker Hill. Movement is now reported as to the northeast, which would be consistent with its moving from just north of Bunker Hill to just west of Gillespie. 8:10 We're home, and the storms soon move over Edwardsville, producing about 3.5 inches of rain at our house in 2 hours, but wind does not exceed 35 mph and there is little or no hail. St. Louis County is now under a tornado warning, and a funnel cloud is reported in West St. Louis Co. A SVR is out for Madison Co. The worst damage in the immediate metro area occurs when accumulated rainwater partially collapses the roof of a department store in Fairview Heights, IL. Total chase distance: about 70 miles. 9:30 As the bulk of the storm has passed over to the south, I videotape near-continuous in-cloud lighting to the SW. There are many flashes per second. By now, the storms have merged into a line, which by 10:30 evolves into a bow echo. Some wind damage occurred near Greenville, and a tornado passed just south of there. Wind damage also occurred along the forward edge of the bow echo farther east and south. 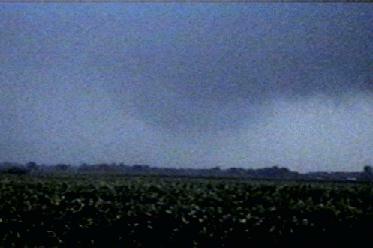 The Greenville tornado and wind damage may have been associated with evolution of the rotating storms that passed north of Edwardsville into the comma head of the bow echo, which by 10:00 or 10:30 was evident east of that area. Here are preliminary Local Storm Reports from NWS STL. 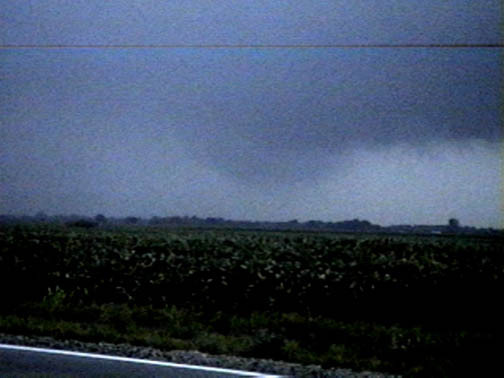 We were on the first tornadic storm in Illinois, just 10 minutes too late for the tornado. Additional information from the Alton Telegraph newspaper indicates that a police officer saw the tornado touch down and dissipate about two miles south of Medora. Here are some additional Local Storm Reports from NWS STL. A number of brief touchdowns did occur in both Missouri and Illinois, causing for the most part only minor damage. The St. Louis NEXRAD reflectivity image from 7:02 p.m. (0002Z) can be seen here. Note the areas of reduced precipitation on both the SE and SW flanks of the storm in Macoupin Co. These areas show up as blue spots, surrounded by the green and yellow of heavier precipitation. Based on radar reports and our observations, I believe that the area on the SW flank of the storm is the meso. 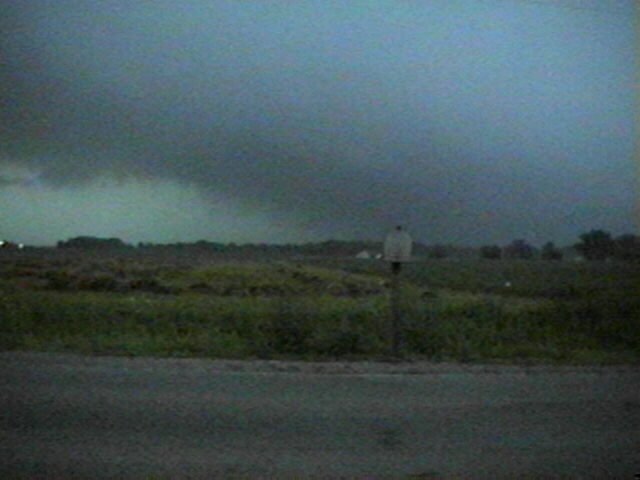 This image is from about the time we observed the lowering, and 12 minutes after the reported time of the tornado. Over the next few hours, the storms gradually evolved into a bow echo, as is shown clearly in this regional radar reflectivity image from 10:45 p.m. (0345Z). Note the very high echo tops - 60,000 feet! Finally, a map showing the locations of the meso at different times, the location of the tornado, and the location of the lowering we saw, along with the locations from which we were viewing the storm, can be seen here.